Few issues seem more difficult to talk about in the Unites States today than racial inequality. Yet perhaps never before has there been a greater need for responsible public dialogue about this complicated subject. The people of the State of Washington feel this need especially acutely because the racial and ethnic composition of this state has been changing so dramatically in recent years, above all because of dynamic growth of the Latino population. The process of public discussion is hampered, however, by the fact that Latinos systematically lack the advantages in education, employment, and political representation that would enable them to take full part in debate about these persistent and troubling inequalities. Indeed, as pervasive social and political disparities between Latinos and the population at large widen, we are tending more and more toward a situation where we are two societies, separate but unequal, with Latinos making up a mounting percentage of the less privileged and the disempowered. 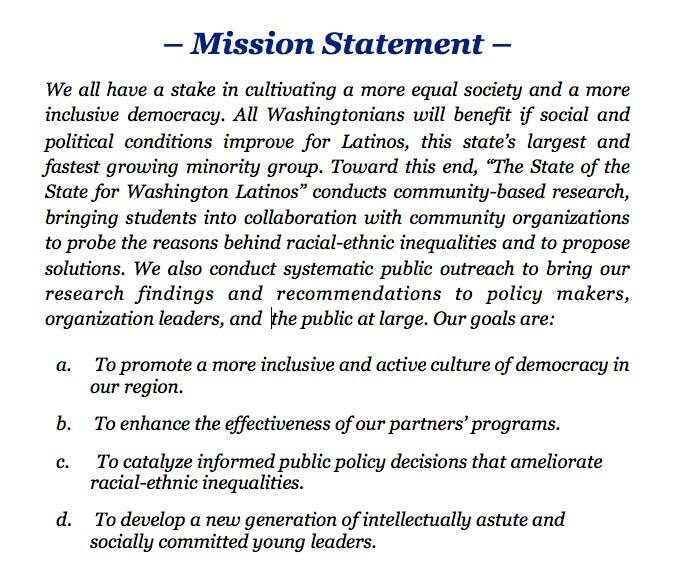 Addressing the disparities many Latinos experience in Washington will require the full acknowledgement and understanding of the many societal and political barriers that perpetuate racial inequality. In response to the widespread disempowerment of Latinos and the continuing political invisibility of these issues in the state, Whitman College professor Paul Apostolidis initiated The State of the State for Washington Latinos to engage undergraduate students in intensive research to bring local racial barriers to light and empower communities with information and strategies to organize and advocate around a comprehensive agenda for racial and social justice.